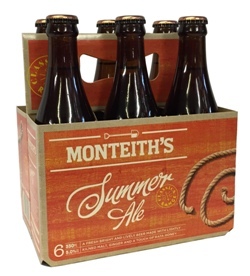 Monteith's Summer Ale is a refreshingly different limited-release beer. True to tradition, this bright gold beer's delicate spiciness adds a real flavoursome zest - balanced by a touch of local Rata honey and four different malts. As a favourite New Zealand beer, try it ice-cold, with a wedge of orange or lime. It's not just the taste, but the happy memories it evokes when I drink the Summer Ale which makes it my favourite beer. So happy it's stocked here. I first tried this in Raglan, NZ in 2003 and have been hooked since. Served cold it has a fresh, slightly spiced taste and it is oh so easy to drink. Supped Raglan style with fries and ribs it's hard to beat. We have actually visited Monteith brewery in Greymouth, NZ two years ago. My wife was so fascinated that she even bouht a "I love summer ale" shirt. It´s one of the best beers out there - not for every day drinking but for all those specials moments you can have in live. It just tastes awesome! This is fantastic beer so pleasant to drink and as I spend UK winters in NZ and it is restricted to summer sales only there I can now enjoy it all year round. I sit in my garden and imagine i'm in the Reef Bar, Mission Bay Auckland loking out at Rangitoto and my favourite, Browns Island in the sunshine. Got to be the best beer I have ever tasted, was so pleased to find this website on returning from NZ. Now every drop I have reminds me of the great summer days I had in the best country in the world! The best beer ever, I wish you could buy it in supermarkets here! Try this beer ice cold on a sunny day with a BBQ... Absolutely beautiful!